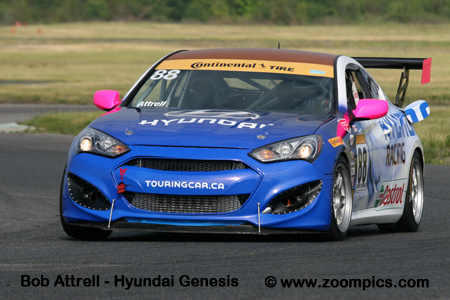 In 2015, the Canadian Touring Car Championship (CTCC) was in its ninth season. With sponsorship from Continental Tires, the series consisted of seven race weekends at five different tracks in Ontario and Quebec. 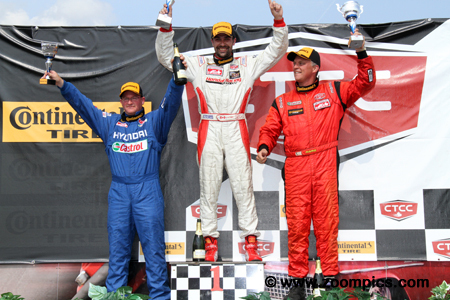 The series opened in May on the Victoria Day Weekend at Canadian Tire Motorsport Park (CTMP). 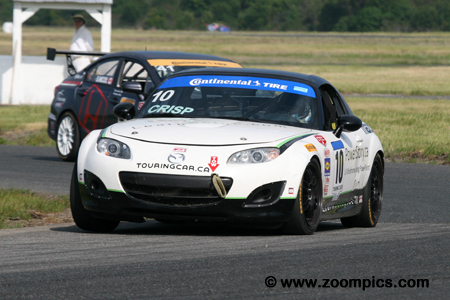 Following CTMP, teams would compete at Shannonville Motorsport Park, Toronto, Circuit ICAR, and Trois-Rivieres. The final two race weekends would see the championship return to CTMP and Circuit ICAR. One of the series biggest changes in 2015 was the elimination of the B-Spec category and the return of Grand Touring. There was a Grand Touring class in the series first season. The championship has three different groups which compete in the same race. Touring: This is intended to be an entry-level category. Vehicles competing in this class are allowed minimal performance enhancements. Engine, suspension and chassis modifications are not allowed. Changes can be made to the ignition and exhaust systems. Brake rotors can also be replaced provided they meet the OE specs. Manufacturers represented in this group include the – Mini Cooper S, Honda Civic Si, Acura RSX and Hyundai Tiburon. Super Touring: Super Touring includes many of the same makes and models found in Touring. However, this category allows engine modifications, changes to the suspension, upgrades to the brakes and aerodynamic body enhancements. Additional manufacturers competing in this group include BMW and Porsche. Grand Touring: The BMW M3, Porsche 996 and Ford Mustang are three of the most popular vehicles racing in this category. Like Super Touring, some changes and modifications are permitted. Cars in this class are typically powered by six or eight-cylinder engines. Of the three groups, these cars produce the most horsepower. The event held at Shannonville Motorsport Park was called the Summer Challenge. This track hosted rounds three and four. Competitors would race on the 2.47-kilometer Pro-Track layout in two 40-minute contests. Not competing at this event was the Grand Touring category. The weather was an important factor during this weekend. Saturday was hot and sunny but on Sunday drivers had to contend with cool temperatures and a wet track. Seventeen cars started the weekend’s first race under ideal conditions. On the pole is Super Touring competitor Scott Nicol in the Velocity Motorsports Club Honda Civic Si – Nicol would retire on lap-18. 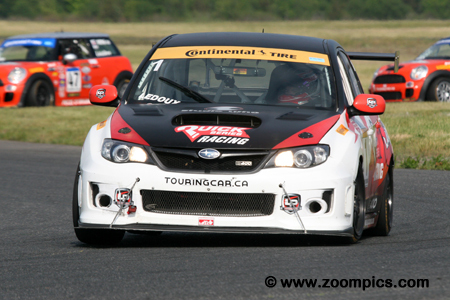 Sharing the front row is the 2014 Super Touring champion, Roger Ledoux. 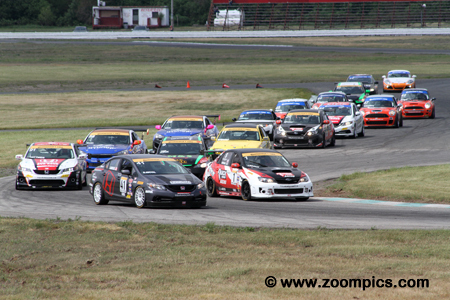 Behind the first row is Nick Wittmer competing in a Honda Accord Coupe and Tom Kwok in the M&S Racing Acura CSX Type-S. 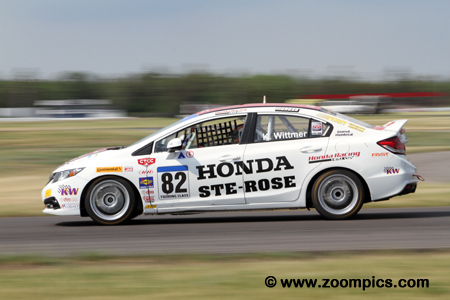 Since its debut, the Ste-Rose Honda Racing Honda Accord Coupe of Nick Wittmer has always been a threat to win but the car has often been plagued with issues. 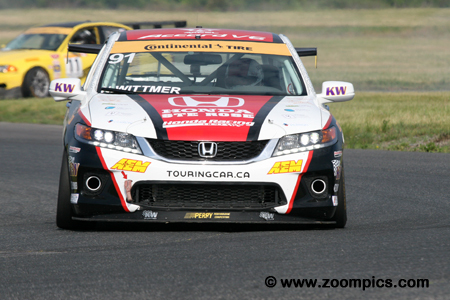 In round three at Shannonville, those problems were behind Wittmer and he scored the Accord’s first victory. On Sunday, he led the race but Wittmer made a number of pitstops to clean a foggy windshield – he finished fourth. The No. 82 Lombardi Honda Racing Honda Civic Si suffered extensive damage at Canadian Tire Motorsport Park and was not competitive. Repairs were made in time for the Shannonville rounds. Driver, Karl Wittmer qualified second in the Touring class for race one and finished third. On Sunday, Wittmer fared much better. He started sixth overall and took the class win by a margin of 7.464-seconds. Martin Crisp was on track to dominate another race weekend. 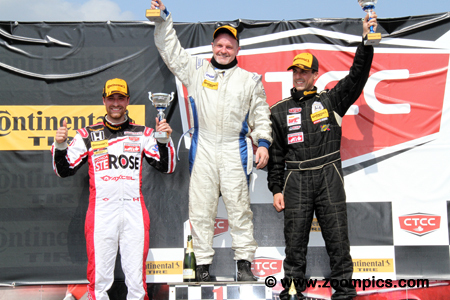 At the season opener at Canadian Tire Motorsport Park, Crisp driving his Touring category Mazda MX-5 won both rounds. He began round three by capturing the class pole position and winning the race. However, on Sunday Crisp was only the fourth quickest Touring car and started twelfth overall. At the checkered flag, he was fifth in class. Round three’s Touring class podium. Touring category winner, Martin Crisp tops the podium. To date, the driver of the wutfun Racing Mazda MX-5 had swept the opening three rounds of the 2015 season. To the right of Crisp is runner-up, Patrick Seguin making a rare appearance in one of the Octane Motorsports Mini. Completing the podium is third place finisher, Karl Wittmer. Eric Hochgeschurz scored a couple of respectable finishes in the first two rounds (fifth and sixth place in the Super Touring category) which put him among the leaders in the driver’s point standings. At Shannonville, the driver of the No. 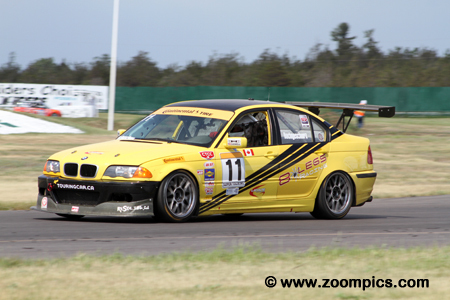 11 8Legs Racing BMW 330i delivered much better results. Hochgeschurz started Saturday’s race in sixth and captured the runner-up position at the checkered flag. In round four, he recorded another second place finish. Defending Super Touring champion, Roger Ledoux was the fastest qualifier for the weekend’s first event but a rules infraction dropped him one position. Starting second, Ledoux maintained his position until lap-14 when he was forced to retire with an engine issue. On Sunday, he shared the front row with pole-sitter Scott Nicol. Ledoux was running second when race leader Gary Kwok retired on lap-19. He inherited the lead and took the race win. 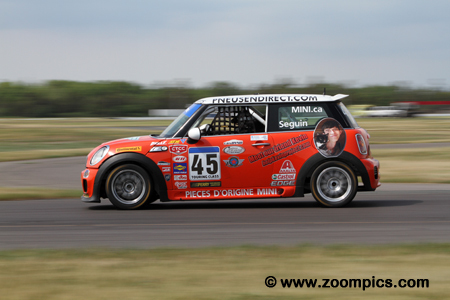 Former Canadian Touring Car regular, Patrick Seguin made an appearance in one of the Octane Motorsports Mini Cooper S. Sequin qualified eleventh overall and third in the touring category for round three. In the race, he gained five positions and was second in class at the checkered flag. In the weekend’s finale, Seguin was fourth – behind Karl Wittmer and two of his teammates – Michel Sallenbach and Alain Lauziere. 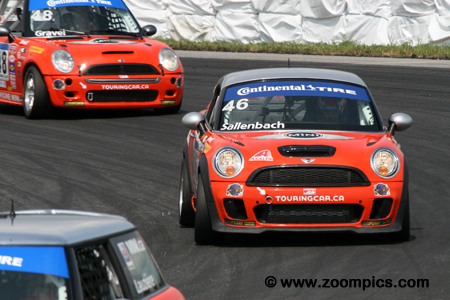 2014 Touring class champion, Michel Sallenbach’s season did not get off to a good start. At Canadian Tire Motorsport Park on the Victoria Day weekend, the defending champion had fourth and fifth place finishes. The event began poorly at Shannonville as Sallenbach retired in round three. However, on Sunday his results were much better – driving in challenging conditions he took the runner-up position in the Touring category. 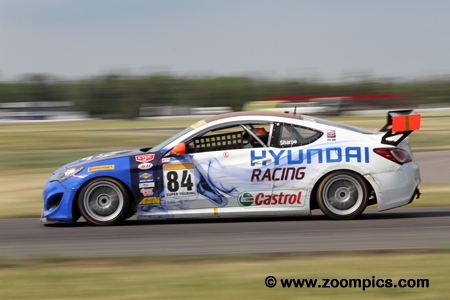 Blanchet Motorsports entered two Hyundai Genesis. The No. 84 Genesis was driven by 2012 and 2013 Touring class champion, Damon Sharpe. Problems in the season’s first two races left Sharpe near the bottom of the driver’s standings. At Shannonville, his luck would change. In round three, Sharpe started fifth in Super Touring and was third at the checkered flag. The following day, he qualified eighth and finished fifth. Saturday’s Super Touring category podium. In the center is the winner Nick Wittmer who scored the first victory for the Ste-Rose Honda Racing Honda Accord Coupe. Standing to Wittmer’s left is runner-up, Eric Hochgeschurz, driver of the 8Legs Racing BMW 330i. Rounding out the podium is 2012 and 2013 Touring class champion, Damon Sharpe.